Authentic, hands-on learning is a key element of Greenwood's Grade 7-8 program. Greenwood’s Grade 7/8 program addresses the complex needs of the adolescent learner. Course content follows the expectations outlined in the Ontario curriculum; what sets Greenwood apart is the personalized delivery of that content. Integration projects: These projects encourage students to apply knowledge from multiple subjects to real-world situations. Learn more about integrated curriculum at Greenwood. Reach-ahead opportunities: Reach-ahead math and extended French options provide additional challenge for students who have mastered core concepts. Students in this program can earn high school credits while in Grade 8. Arts major/minor program: Our Grade 7-8 Arts program allows students to experience multiple areas of the arts — visual arts, media arts, vocal and instrumental music, and dramatic arts — while having the opportunity to explore one or two areas in greater depth. 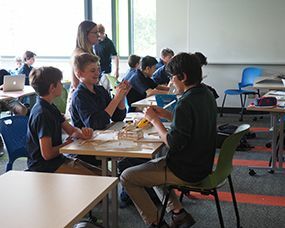 Over the course of the two-year program, Grade 7/8 students also earn one high school credit for the BTT1O course (Information and Communication Technology in Business). The expectations of this course, which focus on the effective use of business software and technology, are integrated with core academic subjects, allowing students to optimize their use of computer software across all subjects.